For a typical music program, the value of musical instruments, robes/uniforms, sheet music and other equipment exceeds $300,000. 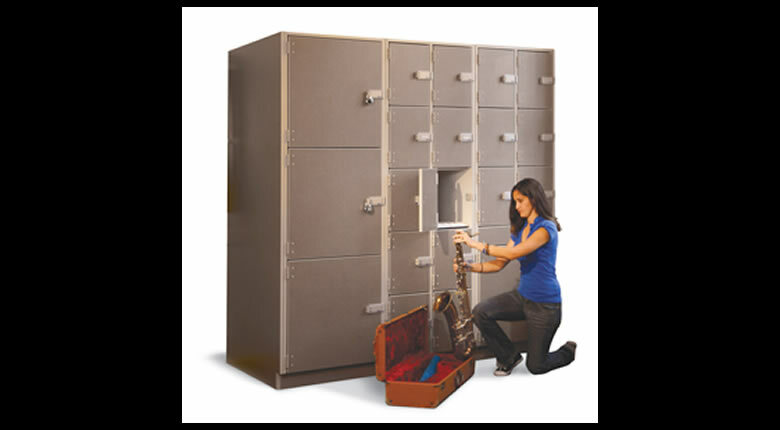 Protecting this investment requires cabinets tough enough to withstand the heavy use of an institutional environment. Features like heavy-duty, load-tested hardware and bolt-through construction help ensure years of service. Modular construction enables future relocation or reconfiguration; field-replaceable components and designed failure points minimize repair headaches. Before buying cabinets, visit an existing installation of them, ideally five or ten years old. Examine how the cabinets are holding up and talk with the people using them. All cabinets look great in a catalog, but their performance over time will determine the true value of your investment. Successful storage solutions improve traffic flow in the music area, providing more time for teaching and learning. The proper arrangement and location of cabinets helps eliminate congestion before and after class. Doors at each end of the instrument storage room also promote efficient traffic flow. Because storage space is always at a premium, ensure that you’re using every square inch with specialized cabinets to best fit various instruments, such as guitars. Corner cabinets can utilize space that might otherwise be wasted. Other options include shorter cabinets that offer extra flexibility for creative room configurations or locations in front of windows. When storage is located inside the rehearsal room, acoustical considerations are important. Choose cabinets with grille doors or no doors to ensure the room’s cubic volume is not compromised. Cabinets are also available with built-in acoustical absorption. For examples of different Wenger storage solutions, click here. Wenger also offers a free music facility planning guide with worksheets, guidelines and a list of other resources.